With datasets growing increasingly large, the need for custom data solutions has soared as well. 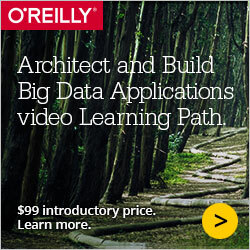 In O’Reilly’s new Learning Path: Architect and Build Big Data Applications — a logical, well-crafted sequence of video training from people who really know what they're talking about, will take you through the entire process of designing and building data applications that can visualize, navigate, and interpret reams of data. Until September 2, buy this Learning Path—28 hours of video training—for just $99. It's yours forever, to learn at your own pace. For more topics, see the full set. Python, Machine Learning, and Language Wars.